Prosthetic Eye Books | Ocular Prosthetics, Inc.
As you continue your prosthetic eye research, you might find it helpful to have a hard copy of useful information. We hope that our website answers your concerns, but believe in providing you with the most information possible. Included below are website links to purchase publications to further enhance your monocular vision transition. If you have any more specific questions, please do not hesitate to contact us. An intimate, illustrated guide to help eye-loss patients adapt to the new way of seeing that faces the newly-monocular. While there are surprisingly-few limitations to using one eye, there are easier and harder ways to learn the material of this book: either invent it yourself (!) or read here what other patients have found! 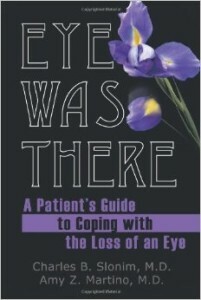 “Eye Was There: A Patient’s Guide to Coping with the Loss of an Eye” by Charles B. Slonim, M.D., Amy Z. Martino, M.D. Eye Was There is created specifically for any person who is considering having an eye surgically removed or is coping with the loss of an eye. It is also created for that person’s caretakers, family members and friends. Eye Was There is intended to serve as a source of information regarding the preoperative, surgical and postoperative options surrounding the loss of an eye. 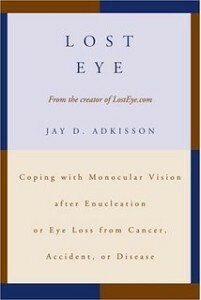 Lost Eye is a collection of e-mails and message threads from Jay Adkisson’s LostEye.com website, along with articles and other helpful information to help persons who have lost an eye to cope with the experience. The message is that life can continue as normal after the loss of an eye, and that there are many other people who are similarly situated and have successfully coped with the loss of an eye for many years.